I will do my very best to provide the leadership needed for this committee to continue to have such a positive effect on shaping the global language of symbols that, among other things, help people to safely use products and navigate their surroundings. Clarion Safety Systems, a leading designer and manufacturer of safety signs and safety labels, is pleased to announce that its founder, Geoffrey Peckham, is the new chair of the International Organization for Standardization’s Technical Committee 145 (ISO/TC 145). ISO/TC 145 is one of the most influential standards-writing committees in the world. This international committee standardizes the symbols that appear on products and for use in man-made environments. This includes the symbols the public sees on a daily basis (such as the controls for headlights in cars), as well as the symbols on labels and signs in workplaces that help keep employees, contractors and visitors safe (such as warnings to wear a specific kind of personal protective equipment, like respiratory protection). Peckham was nominated to the position by the British Standards Institute in 2016, when he accepted the appointment and agreed to replace Barry Gray as chair when Gray’s term ended. Safety sign and label standards are a large part of ISO/TC 145's work. It is the only international committee responsible for the standardization of graphical symbols used on safety signs and labels. It currently has 19 countries as participating members and 32 countries as observing members. As a company, Clarion is a longstanding and active member of the standards bodies responsible for safety sign and label standards – the American National Standards Institute (ANSI) domestically and ISO internationally. For twenty years, Clarion has been a member of ISO/TC 145, along with the likes of John Deere, Caterpillar, and a number of other organizations. In addition, Peckham also currently serves as chair of the ANSI Z535 committee for Safety Signs and Colors, the committee in charge of the U.S. standards for safety colors, signs, symbols, labels, tags and safety information in manuals. Visit Clarion’s website to learn more about the company’s standards expertise and industry leadership. Clarion has a number of resources available to share its safety sign and label standards expertise in its comprehensive online Learning Center. This includes a video library focusing on topics related to safety, risk reduction, the legal implications of warnings, and standards-related issues. One of its videos, “The Case for the Standardization of Graphical Symbols,” describes how ISO is creating a new global language – independent of words – that helps to keep people safe from harm. ISO is an independent, non-governmental international organization with a membership of 161 national standards bodies. Through its members, it brings together experts to share knowledge and develop voluntary, consensus-based, market-relevant international standards that support innovation and provide solutions to global challenges. The formation of ISO/TC 145 dates back to 1970. 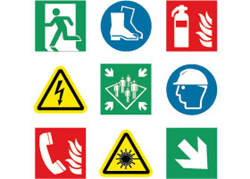 The standards body has three subcommittees: Public Information Symbols (SC1), Safety (SC2), and Equipment and Control Symbols (SC3). To learn more, visit http://www.iso.org.